2014 will probably be seen as a banner year for Resonance Records. Within a few months of each other they released John Coltrane's Offering: Live at Temple University (which is probably the most talked-about album of the year, other than Mostly Other People Do the Killing's Blue) and this two-disc set of two newly discovered live recordings by saxophonist Charles Lloyd. Like the Coltrane set, Manhattan Stories also comes with a huge booklet of photos and essays, including an interview with Lloyd, all of it added to the set. Both performances occurred during the summer and early autumn of 1965 and they represent an exciting "in-between" time for the tenor saxophonist. 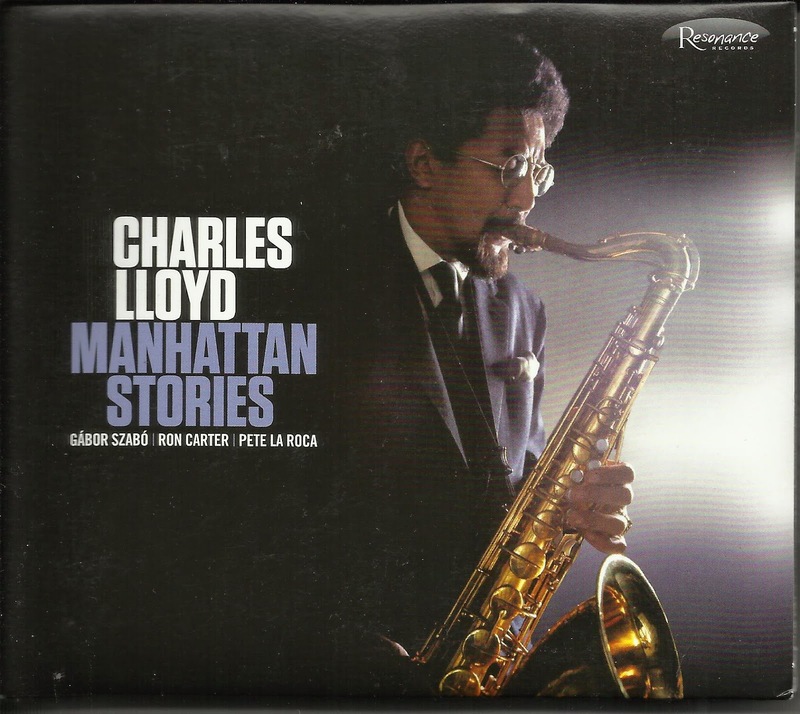 Lloyd had already logged time with the groups of Chico Hamilton and Cannonball Adderley (the latter considered by many to be "mismatch," as Michael Cuscuna mentions in this liner notes). He also finished sessions for Of Course Of Course, his second Columbia album earlier that year with guitarist Gabor Szabo, bassist Ron Carter and drummer Tony Williams. By the summer, Williams was gone, replaced by Pete LaRoca, whose performances can inspire one to search out the few albums he made as a leader, to get a greater dose of his powerful, unsung playing. One disc comes from a set the group played at the Festival of the Avant-Garde at Judson Hall. The other comes from a gig recorded at the infamous Lower East Side club Slugs' Saloon. The sound quality of both sets is impeccable, capturing the excitement of these four at a time before they became revered jazz legends, but clearly revealing why such designations eventually came along, at least for a couple of them. Considering the direction of jazz in 1965 and the name of the Festival of the Avant-Garde, disc one doesn't find the Lloyd quartet heading outward in any extreme direction. But even with their feet remaining on the ground, the three lengthy tracks have plenty of fire power. "Sweet Georgia Bright," from his Columbia debut Discovery! (all these exclamatory statements!) goes on for nearly 18 minutes, none of it excessive, from Lloyd's somewhat throaty tenor to Sims' propulsive work all over his kit. The tender ballad "How Can I Tell You" stretches out for over 11 minutes, and Szabo's "Lady Gabor" has the leader on flute for the first of two versions of this 6/4 vamp. Despite its fertile ground for musical innovation, Slugs' had a seedy reputation too. This was a place where pushers and hustlers co-mingled with musicians like Jackie McLean and Sun Ra, or Salvador Dali, who showed up at least once with an entourage. For better or worse, the space has gone down in history as the locale where trumpeter Lee Morgan was shot and killed by his ex-girlfriend in 1972, which eventually put the kibosh on the joint. So it comes as no surprise that audience chatter can be heard during the Lloyd set recorded there. But if anything, the rugged nature of the room brought out the best in the band. Also consisting of three lengthy tunes, disc two begins with "Slugs' Blues" which Lloyd supposedly wrote virtually on the spot. While adhering to the traditional structure, the group mixes it up as they go. Most impressive is Carter who walks a bit, switches to rich double stops and then, in his own solo adds some flatted fifth to make it sound even richer. No wonder someone (maybe a band member, maybe an audience member) repeated yells, "Yeah," throughout the set. La Roca really drives the second "Lady Szabo," which gets all manner of ideas out of Lloyd, including a moment where he predicts the vocal style of Leon Thomas. "Dream Weaver," later to be the title track of high-regarded album, is heard here in its early, but clearly set, stages. A year later, Lloyd would form his own "classic" quartet with Jack DeJohnette, Cecil McBee and Keith Jarrett, and the Lloyd band heard here would be remembered only by a few. Thankfully, a few people had the foresight to document this work, which serves as a reminder that legends have to start somewhere.